Recreational vehicle air conditioners systems have not undergone much change since they were developed in the 1960s. A report shows that 1 in 12 American homes own a RV or motor homes. One of the most popular brand of RV is Winnebago which pioneer the first recreational vehicle in the 1960s. This brand name has become a generic term for motor homes similar to Xerox machine for photostating or KODAK for photography. Other manufacturers of RV which came along after that are Roadtrek from Canada, Fleetwood Enterprises from California, Thor Industries from Ohio, Newmar Corporation from Indiana and Monaco Coach of Oregon. The typical construction of a RV must have a minimum of a storage areas, beds, table, kitchen and air conditioner system. Bigger units of RV may have bathrooms, living areas, refrigerators, satellite TV, internet connection, awnings and even a storage area for a small car. RVs are popularly used during summer vacation when many families will just load their things into the vehicle and go off for long vacation in various parts of the United States and Canada for two to four weeks. 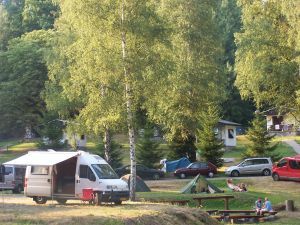 This kind of recreation is made possible as there are many RV parks which provide facilities such as electrical supply, water, wash rooms, swimming pools, satellite TV and internet access. In recent years, there are many who decided to sell their homes and stay in RV full time while moving around from state to state. Quite a number have modified their vehicles to become RV according to their taste and requirements. Filter should be checked. If it is dirty, wash and dry it before re-installing it. If it is damaged, replace it with the same model recommended by the manufacturer. Dirty filter cause blockage of air flow and reduce the efficiency of the system. Check and clean it at least once in 6 months and more regularly if you are using it frequently. Anchoring System and shroud of the air conditioner must be checked for oxidation, wear and tear, tightness of bolts. If they are loose, tighten them or totally replace the mounting bracket for safety purpose. Vehicles go through high amplitudes of vibration and improperly mounted air conditioner equipment can cause danger to the users on the road when it came off. Condenser and Evaporator must be cleaned from bugs, leaves, dust and other debris that tend to accummulate at the coil and fins. Crushed fins should be straighten up to ensure proper air circulation and heat exchange of the system. For long term maintenance, it is a good idea to install a fin-and-coil shield to protect the fins. Lubricate all moving parts of the RV air conditioning system especially the motors. Drain pan is used to collect the condensation that happen during the operation of the air conditioners. Check that it is not blocked by debris. Thermostat of the air conditioner should be tested. See that the fan and the temperature control is working well. Know where the fuse is located. Always have a spare fuse available just in case it blows when in operation.